Just before Easter the Department of Transport announced its response to a Consultation on the construction of a new HS2 Hub station for Crewe. The response was positive, giving the go ahead for a development that will bring substantial benefits to Crewe and to Cheshire East. Unsurprisingly this Consultation raised little interest in Macclesfield but the approval of the Crewe Hub could potentially have a massive impact on the town. At the core of the case for the new Hub is a plan to build 400m long platforms. This will enable double length HS2 trains to travel at high speed to Crewe where the two halves will be uncoupled to create separate HS2 compatible services to Liverpool and Preston. This will create additional HS2 capacity that will be used to provide an HS2 compatible service to Stoke on Trent via the existing Stoke – Stafford line. The surprise for Maxonians is that this new service was proposed to terminate in Macclesfield rather than the Potteries (see background note 1). destination, or potentially a terminus. This has significant implications for the town, not just with respect to rail travel but to the regeneration of our town centre (background note 2). During the recent Cheshire East Consultation on the regeneration of Macclesfield Town Centre MIM’s response highlighted the need to put renovation and re-purposing of existing buildings ahead of other initiatives and questioned the lack of available funding for such an approach within the Council’s plans when compared with the investment bring made in Crewe. 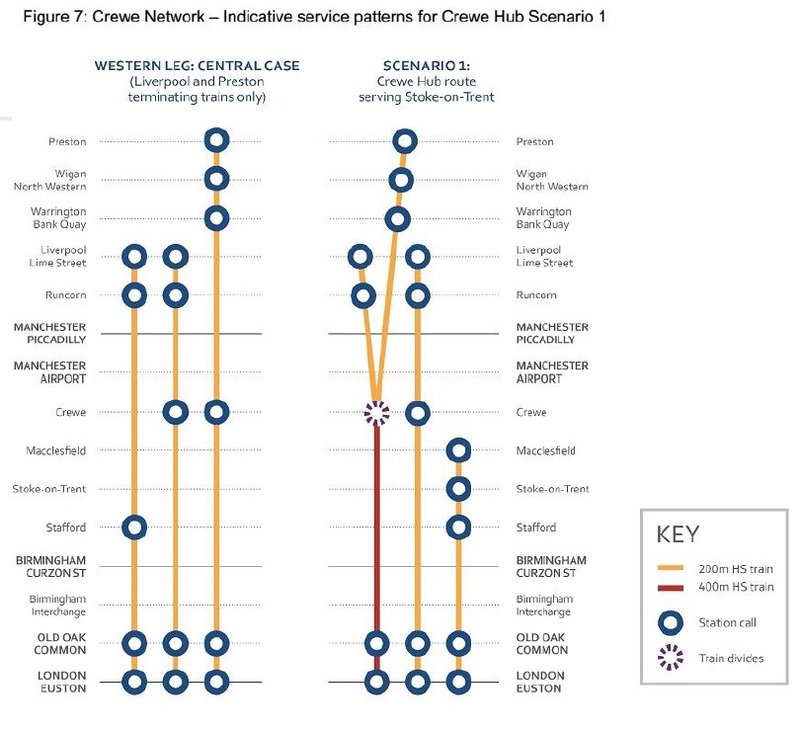 It is now clear that much of that funding is related to Crewe’s role as an HS2 destination (background notes 3 and 4) and the MIM board therefore believes that Macclesfield must make the most of the opportunity created by the Crewe Hub to become a part of the HS2 project. MIM will therefore seek to take a leading role, working alongside the Borough and Town Councils, to engage the community in realising the potential benefits of being an HS2 destination. A Macclesfield involvement in the HS2 project also has the support of the LEP. 2. The Secretary of State intends to ask the West Coast Partnership (WCP) to include a service to Stoke-on-Trent in its market development and service planning. We recognise there may also be a case to extend this service to Manchester Piccadilly, as well as to look at other options to serve not just Stoke-on-Trent but other destinations with either HS2 services or new direct WCML services to London. 3. The Government has a bold vision to deliver HS2 in a way that maximises economic growth and spreads regeneration. We want to see the investment in HS2 have the greatest possible impact, with the new railway unlocking opportunities to transform local economies across the UK. Cities know what works for them, and for this vision to become a reality, HS2 growth needs to be locally led and designed to fit within the local context. 4. “Preparations to make Crewe HS2 ready have had a £10m injection. The government has awarded the Local Growth Fund grant over a four year period to support Crewe’s town centre regeneration plans under Cheshire East Council’s initiative ‘Crewe – High Speed-ready Heart’”.